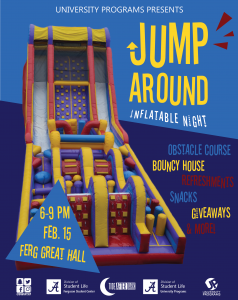 University Programs is excited to host Jump Around, a night of inflatables, on Friday, February 15 from 6-9 p.m. in the Ferguson Center Great Hall. This FREE event will feature of a variety of inflatable activities, food, music, and more! For up-to-date information on all of our events, follow us on social media @UAWhatsUP!